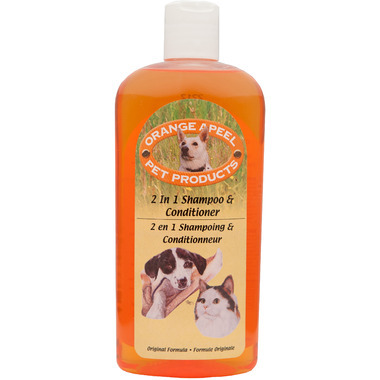 Orange a-P-E-E-L 2-in-1 Pet Shampoo & Conditioner was designed and formulated and is exclusive to Orange a-P-E-E-L. It's a natural cleanser that a natural orange scent, with an exclusive formula that contains 6 botanical extracts including Aloe Vera and Sea Care. This penetrates the coat to moisturize and Phytokeratin derived from plants. So happy with this shampoo for both my shihtzu and my shihpoo. two slightly different coats of hair and both amazing results. Love the smell and how their hair is left so silky smooth. Love the results on our puppy. Clean, and great smell. We have two dogs with two vastly different types of coats (Bernese/Shepherd mix & Bichon/Cockapoo mix). Both dogs look and feel great after using this. No cloying, fake odor.